In 1960s Los Angeles, a loosely-affiliated group of artists began working not with paint and canvas, clay and wood, charcoal and pen, but with two less concrete mediums: light and space. The so-called (perhaps unimaginatively) Light and Space artists were responding to new ideas about viewer perception in art, and experimenting with new materials that were suddenly widely available from Southern California-based industries: polyester resin, coated glass, Plexiglas, neon. While artists in New York were working with similarly industrial materials and playing with the viewer’s perception of space, the emphasis on light as a medium became unique to the L.A. group. This seems to have been no accident, but a response to the place itself—there’s a certain quality of radiant light that exists in Southern California, where the sun always shines, reflecting on the waves and cars and surfboards and refracting through the immutable smog. Say what you will about L.A., but they don’t make light like that anywhere else. “Adding glass [to a canvas] was totally intuitive. I liked the work’s feeling of simplicity, and the fact that the imagery now included the wall behind the canvas. This led to incorporating the light in front of the canvas in an ‘unpainterly’ way. I chose mirrors to replace the clear glass. I scraped away the silvering so that the reflected light and the transmitted light created the shape of a tesseract, which was also the shape of the canvases. Bell’s Untitled of 1967, on view in SAM’s Light and Space exhibition, is the result of this unconscious metamorphosis. A perfect cube made of coated glass, the work is a pure expression of volume, space contained and revealed. The thin, metal film which coats the glass allows the light filtering through the material to reflect and refract in unique ways. The edges emerge and disappear, and the sides darken and lighten as you move around the work. Though all six sides of the cube are identical, no two people will experience the same view of the whole—everything depends on your position in relation to the object, and its position in relation to a ray of light. 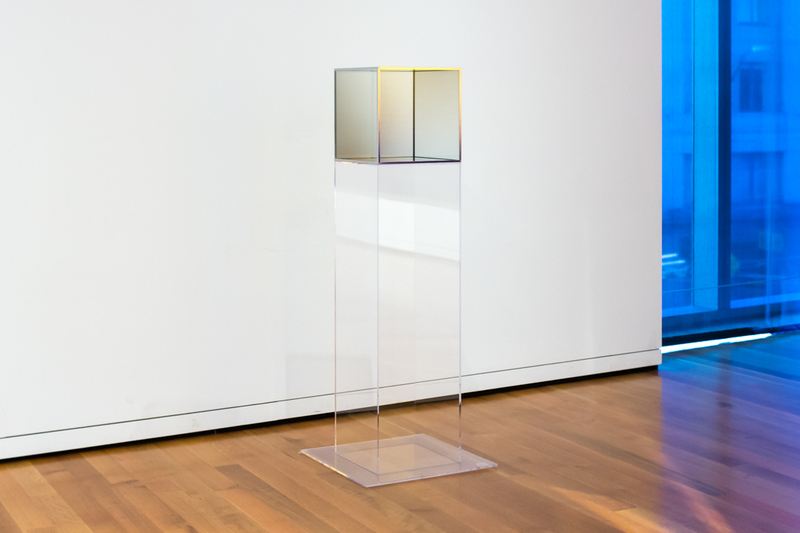 For many of the Light and Space artists, an artwork only reached its full potential when it was engaged in this relationship with a viewer—an object in an empty room without anyone to look at it is, in essence, not doing its job. Bell was no exception to this belief: “In my opinion all artwork is stored energy. The art releases its power whenever a viewer becomes a dreamer.” Dream on, friends, and come see what kind of energy this enigmatic box releases for you. Image: Untitled, 1967, Larry Bell, American, b. 1939, silicon-monoxide-coated glass and chrome-plated metal, 59 x 22 x 22in. Gift of Anne Gerber, 2000.168, ©Larry Bell, Photo: Natali Wiseman. All quotes are excerpted from Larry Bell, Zones of Experience, exh. cat. (Albuquerque, NM: Albuquerque Museum, 1997).